Brought to you by GrandMA Studios, makers of Reflections of Life: Tree of Dreams and the Whispered Secrets series! You've been summoned to Creatos to save Princess Espera, who has been attacked and ensnared by magical vines. But when a group of strange monsters arrives suddenly and captures the Queen, you quickly realize that the princess' plight was just a distraction. Without its Queen, the World of Fantasies will begin to crumble... and once Creatos falls, the rest of the world will soon be destroyed! Now, you must set out on a journey through several magical worlds. Can you reveal the villain, return the Queen, and restore balance to the world in time? 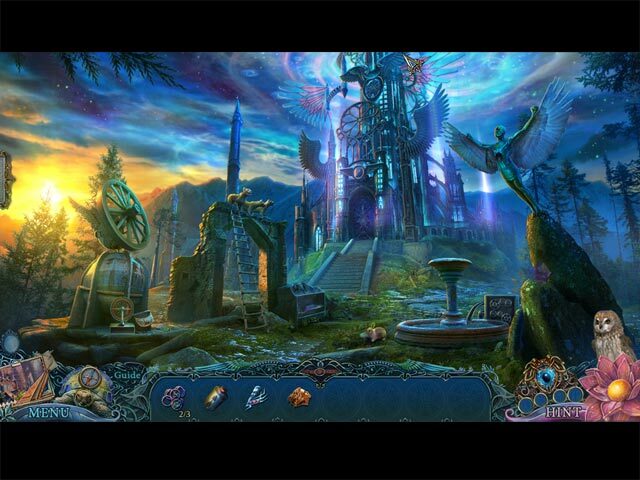 Find out in this gorgeous Hidden Object Puzzle Adventure game! Reflections of Life: Equilibrium Collector's Edition is rated 4.4 out of 5 by 73. Rated 5 out of 5 by julie500 from fun fun game I dont often write reviews unless the game is very good or very bad,in this case this game is very good.Incredible value for money with different puzzles.Well done Grandma Studios!! Rated 5 out of 5 by Bumbles2 from Royalty rescue mission for our guardian Grace !!! Beautifully awesome game...which I plan on playing again !!! Artistry is exceptional with nice crisp and clean scene's !!! Music is fitting for the theme of this game !!! Some challenging area's... but that's ok because a lot of the puzzles and HOP's are quite different...you just have to use some intellect and strategy to conquer !!! Not going to get too wordy here as a lot of other gamer's have already said what I wanted to say...all positive !!! This is definitely a game worth buying...lots of fun playing and definitely gets your brain cells working...LOL Have fun all !!! Rated 5 out of 5 by LunaNik from I almost NEVER give 5 stars. This game earned them. Reflections of Life: Equilibrium CE Review based on completed game + bonus chapter + extras PROLOGUE... Every once in a while, a game comes along that appears to conform to casual game conventions, but breaks all the rules, thinks outside the box, and raises the bar. This dev often flies under the radar. Equilibrium should change that. There’s a lot of original content here. ONCE UPON A TIME... The King of Creatos has summoned you in your role as Guardian to rescue Princess Espera from invasive, magical vines. But this crisis is just a decoy to clear the way for monstrous creatures to kidnap the Queen. Without her, Creatos’ reality will crumble and, when it does, all other worlds will be destroyed as well. You must track the creatures through the worlds to their destination, uncover the hideous plot, and put a stop to it before the delicate equilibrium the Queen’s magic creates is disturbed forever. PLAY THE GAME... As this incredibly long game progressed, I became increasingly impressed with the variety and originality of the HO scenes and mini-games. Even puzzles we’ve seen before are presented with a fresh approach. HO scenes include interactive list (where most of the list is interactive), sequential silhouette, all of one item, all of one type (like items of the same color), multiples, matching pairs, multiple scenarios, switching perspectives (from Grace’s viewpoint to her owl’s), and the narrative story which is find and replace. Mini-games include all the following and more: • Move columns and rows to complete the runes. • Turn five colored keys to open matching locks on a grid to release springs in order to move two crystals to their destinations. Springs release both vertically and horizontally. • Stop a vine from growing across a grid by starting fires in its path. • Guide floating black spots to one of four shells. If the spots touch each other, they increase in number. • On a chessboard, use the queen to capture the pieces on the board without running out of moves (running into a dead end). • Collect runes of the same color by strategically guiding a fish through the maze. If you hit a different color, you’ll have to start over. • Unlock a gate by turning groups of circles to guide colored tokens to their matching goals. 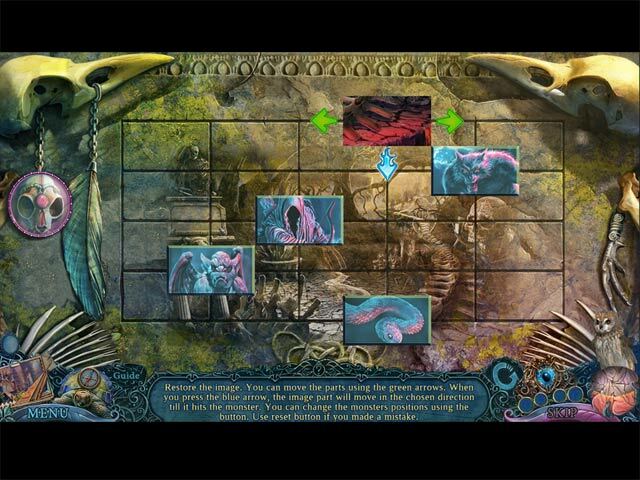 • Jigsaw puzzle variations are mostly unique and require strategy: slide pieces into place using monster-themed blocking pieces, correctly order pieces on a spiral so that they end up in the right places, choose the correct of three pieces at each turn, move only the top pieces in each column (helped by buttons that either clear a column or re-sequence its pieces). There is still quite a lot of the “shaped inset requiring a matching medallion” type lock for boxes, books, and doors. And lots of things have missing parts or are broken. However, the story is so well-written, and the exposition is done so well that no part of the game is boring. SIGHTSEEING... Stunningly beautiful graphics! The conceptual presentation of each world is utterly fantastic. Backgrounds are panoramic and detailed, and close-ups are realistically textured. I like the palette; while there are a lot of brights, they are tempered by neutrals. Animation and cutscenes are gorgeous, and the NPCs do lip synch. SOUNDBOARD... The music ranges from ethereal piano to moody orchestral pieces to world music to a waltz to a soothing harp number to a dramatic percussive arrangement. Frankly, this soundtrack has the most variety of any casual game I’ve played. Voiceovers were appropriate and professional, and environmental sounds were done well. TOOLBOX... The map is interactive and shows active areas. You can replay cutscenes. The inventory panel locks open. Of course, you have your owl to reach things you can’t. And you have a magical ring that will activate the clocks you’ll find here and there. Once activated, you can use the ring to find four runes. The clock will then generate an image which, when matched to the scene, will reveal a hiding place which will give you an item. OH BOTHER! The only technical difficulty I encountered was that the game crashed about five times. I’m hoping that un- and re-installing it will solve that, as it usually does. The crash didn’t affect anything else; none of my progress was lost. OOH! PIECE OF CANDY... Replay the HO scenes and the mini-games. Collect tinted glass shards for a jigsaw puzzles which will open a hidden room (and you can go back and gather the ones you missed). Save the citizens of Creatos and the other worlds in the bonus chapter. Of course, you have the SG. Download the eight beautiful soundtracks and ten stunning wallpapers. Replay the cutscenes and check out the concept art. EPILOGUE... I highly recommend this game. Despite reusing the “fate of multiple worlds at stake” and “person in danger” themes, the story was engaging and well-integrated into gameplay. Gameplay was so varied that boredom wasn’t possible. (I do strongly suggest that you check the box marked “make mini-games harder.”) And the music and graphics were top notch. More like this one, please! Happy gaming, fishies! Rated 5 out of 5 by tutortime from Excellent Game! This game seemed to play on and on. Loved the long length. The CC edition is worth the extra money as the bonus chapter has 2 extra features. The game had another feature of finding 3 shards of glass in each scene. At the end, any shards you didn't find, the game allowed you to revisit the scene and look again. Love that feature. Bottom line, great game. Rated 5 out of 5 by possumb from Best Game Ever I have played the previous Reflections of Life and was amazed. But now 'Grand Ma' has surprised me. It is such a beautiful game; ful of adventure and beyond imagination - all I can say: Thank you for this Game - Best Ever. Rated 5 out of 5 by krystal59 from Totally my kind of game!! First off this game was long. Bravo. Big points from me just for that. It was also beautiful with great use of color and tons of detail. And I'm a player that notices detail, right down to things like small red flowers in a scene. This one also had a bonus chapter and a hidden chapter adding to the length and making it really worth the money. Okay.. so second really great thing was how much there was to do. Every location had many things to find or unlock. There were three collectibles in every scene. Three! and they were sometimes really not easy to find. Wow I love this! More devs should do this. I loved searching for the shards of glass. It's just no fun if you walk into every scene and pick out the collectible in two seconds flat. This game made me work for them and I did find all 114. Very good. I liked that there was a tab at the side where you could keep track of whether or not you had found them all. It also took you to the achievements which were mostly game play related but did have some you had to strive for as well. Then there were all the extras thrown in like your owl who gets up to high places you can't reach and who covers up and has a nap if you are still for too long. Then the clocks which when you piece them back together, require you to use a ring which then produces an amulet where you search for glowing runes. these are then used to find a "mystical piece" that you must match somewhere within the locations. Incredible! The first HO scene is three different scenes and you must move the objects back and forth between them to finish. There are not too many HO scenes in the beginning but they pick up as you go along. There is also the story being told that opens into a book where you must find and replace missing pieces. With each three or so that you find, the story continues. Just a ton of things to do in this one. BUT my most favorite of all was the mini games!! There was an icon in options that let you check if you wanted the mini games to be a bit harder and I instantly clicked it. And there was such a huge selection of mini games. I especially liked the fish in the maze and the slide jigsaw puzzle. Some I solved in as little as a minute while other took in excess of twenty. I really like having to work at solving the puzzles. My only not so positive was the storyline. The old evil mwa ha ha guy who wants to take over all worlds and despite having lots of opportunity, seems unable to stop you. Whatever. I actually didn't mind as the storyline really took a backseat to everything else in this game. I liked that my character actually spoke. Too often everyone has a voice except you so it was nice. Overall I was very impressed with this one. Really great graphics, tons to do and best of all it actually had some challenge. Bravo! Really well done. I loved it. Earns five stars from me. Rated 5 out of 5 by Italia47 from Without the bow, he's just a kid! Loved that line! Quite a wide variety of things to do in this fabulous game--fairytale indeed, but excellent graphics and special effects. You will be completing many, many tasks and tasks within a task; and thanks to the jump map you won't go crazy wondering where to go next, although the game I played previously had no transporter map and it was extremely challenging to get around. But even with the jump map, this game is very challenging. For achievements you will need to collect 114 shards and I got so engrossed in the game that I forgot about searching for these. This far I've only found 40. I'm sure there will be more in the Bonus Chapter. You'll have numerous objects to locate and you won't find them right away either. Once again the storyline is about good vs. evil but it's a good one that you'll enjoy. The cut scenes are good and the acting is great. I'm in the Bonus Chapter now and there is a new problem which is not surprising, but it should be lots of fun to play. I have to applaud the developers on this one because of the variety of clever puzzles and innovative HOS and the graphics, and music. 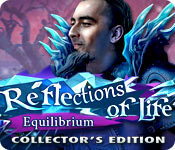 Reflections of Life: Equilibrium is definitely a two-thumbs game! I highly recommend it! Rated 5 out of 5 by bluebirdpod from GrandMA Studios Games ROCK ! 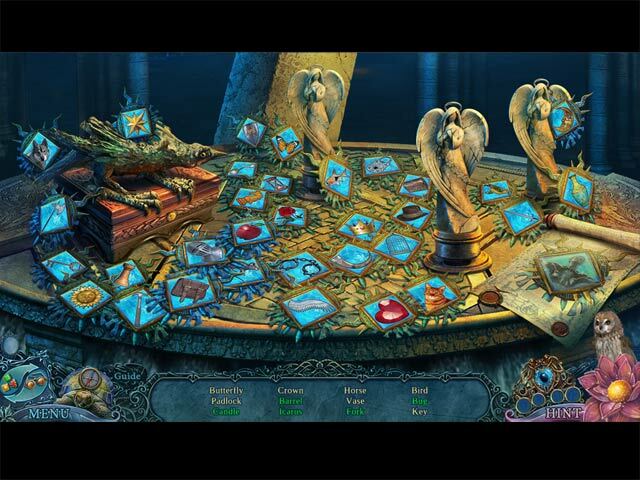 Every single game they have made are the best of the hidden object games on Bigfishgames. Don't waste time, if you haven't tried one of their games, all of them are wonderful and have so many extra pieces to figure out and find. Just played Reflections of life and could not stop playing it!. Get the collectors versions that way if you need some help the strategy guide will get you past that tough spot and with the bonus chapters in the collectors versions they add more storyline to the games. Rated 5 out of 5 by camilito34 from Best game this year! I do not usually take the time to write reviews.. especially long and detailed. I buy games weekly and love them..but, I am very picky. I have played some great games this year..but so far..this one beats them all. Beautiful graphics,awesome cut scenes, great storyline, fun puzzles, great Hos/interactive. Travel and warp through mirrors with your owl friend. It has a bonus game and an additional game. I do not want it to end. Ty to developers for such a great game! The Queen of Creatos is missing, and if you don't get her back soon... the entire world will crumble!